To get up to Four Aces Claim one left US 95 in the absolute middle of nowhere and drove along an almost invisible track towards the sheer purple Moenkopi sandstone cliff. Finally you saw a narrow back-up switch back road up the Moenkopi and headed up with substantial doubt that it was possible to get to the top. 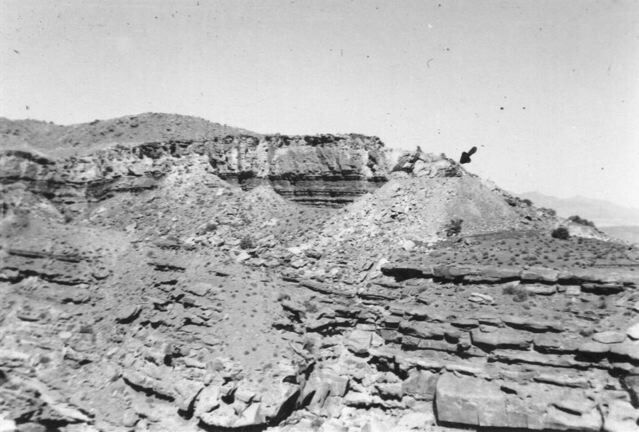 After a sharp turn at the top (which I later widened on my own with dynamite) one wandered around on the gradually sloping, heavily eroded gaily-colored Chinle shale until arriving at the end of two tunnels driven into the Shinarump outcrop on top of the Moenkopi. 1955 View of Four Aces tunnel from about half a mile. Note the mine tailings from 1893 below. 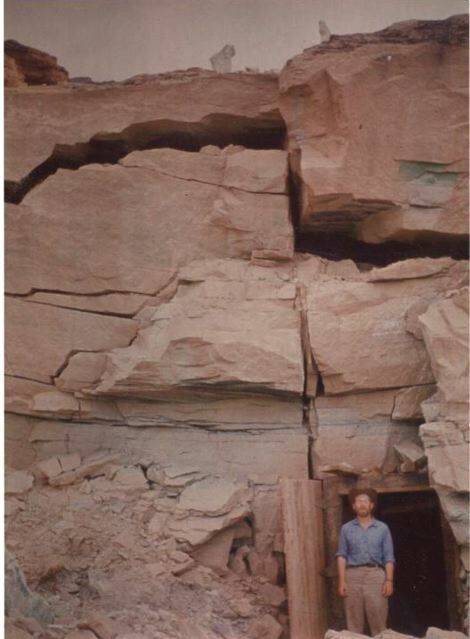 The light colored rock is Shinarump conglomerate, dark rock below is Moenkopi sandstone, sloping stuff piled on top is Chinle shale. It was quite a sight that met my eyes when I arrived. Jerry [[I have forgotten his name but this will do]] was a very small 45 year old man in worn clothes leaning on a rifle against the front of his pickup truck with two pistols stuck into his belt one on each side. Three guys (younger than me) were armed and trying to look as tough as possible and I think there was another guy perhaps in his late 30s not posing. I introduced myself and ascertained they were the drillers I was waiting for. I warned them about the difficulty of the switch back road and started to lead them up in my company jeep. Their brand new compressor truck followed me driven by one of the kids. Before we had gotten very far up it started to slide off the side of the road. It seemed to me that it could be driven right back on but all of them said they did not think so and that it was worth $40,000 (even that much was a LOT of money in the early 1950s) and that I needed to get something to pull it back on the road. I did as told and at the buying station folks who had never seen or heard of me called up the guy at Fry canyon who was in the same condition. I asked him if I could borrow his truck saying my company would pay for it. Without question he said he would come right up. In about an hour he appeared and I think the mine owner loaded his cat on the truck and we (the truck owner and I) headed down the road towards Four Aces followed by the drilling crew ruffians.